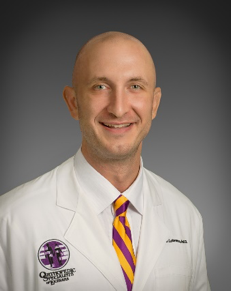 Chase Lobrano, MD is the latest addition to the Orthopedic Specialists of Louisiana and the Specialists Hospital Shreveport team. Specializing in total joint replacement of the knee and hip, Dr. Lobrano has spent the last year in his fellowship at Southern Illinois University, focusing on adult reconstructive techniques in hip and knee replacement. He is passionate about robotic total joint replacement and is currently certified in Mako Robotic Partial Knee Replacement and has plans to certify in Mako Robotic Total Knee Replacement with Specialists Surgeon, Steven Atchison, MD by Fall, 2017. Dr. Lobrano also utilizes the Anterior Approach-Hip Replacement, when applicable. Dr. Lobrano believes in a hands-on approach to patient care. It is important to Dr. Lobrano to establish a strong level of communication with his patients, so that he may offer a knowledgeable and reasonable treatment plan that work to restore the patient’s quality of life. Growing up in South Louisiana, Dr. Lobrano has always enjoyed the outdoors and working with his hands. In his free time he enjoys hunting, fishing and athletic pursuits. He currently is combining is love of the gym and carpentry skills by converting his garage into a home gym. Dr. Lobrano and his wife, Dr. Susan Lobrano (ER Physician, LSUHSC) are the proud parents of two young children, Olivia and Hank.